Strategy for Live Casino Holdem - A Live Dealer Casino Holdem Guide. Live Casino Hold’em is based on the card game Texas Holdem Poker, which is a multiplayer poker variant. In Texas Hold’em players are dealt 2 personal cards and 5 community cards and attempt to beat each other by making the best 5 card poker hand out of the seven cards dealt. No Wagering, Min £25 Deposit. Huge Selection of dedicated tables. The objective of Live Casino Hold’em is to beat the dealer, by having a better 5 card poker hand than he does. An unlimited number of people can play the one set of player cards. The game is played with a standard 52 card deck. The deck is shuffled and changed after every hand, and depending on the live casino it will be done by an assistant to the dealer, the dealer themselves or an automatic dealing machine. As in poker, hands are ranked according to a preset value. Betting takes place before any cards are dealt and again after the flop or 3 community cards have been dealt. After betting has taken place the remaining two community cards are dealt. As Casino Hold’em is played against the dealer it’s a perfect game to be played at a live casino. That’s why you’ll hear and see it referred to as Live Casino Hold’em. Casino Hold’em was developed by Stephen Au Yeung as a training aid for his girlfriend, who he was teaching how to play Texas Hold’em Poker. It first appeared online in 2010 and since then a few live casino providers have purchased licenses to use it. Evolution Gaming, Playetch, Ezugi and Microgaming all offer Live Dealer Casino Hold’em. The game is the same at all the providers, with one exception. Evolution Gaming has added a networked Progressive Jackpot to it’s version. 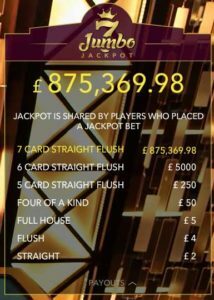 The jackpot currently stands on April 25, 2019 as £2,470,444. There is 3 opportunities to bet in Live Casino Holdem. The first is the Ante Bet, which is placed before any cards are dealt. The second is an optional Bonus (or AA) side bet that is placed at the same time as the Ante bet, which pays out if a pair of aces or higher is dealt in the first 5 cards. The third is the CALL Bet, which is twice the Ante bet and is placed if your decide to play the hand after the 3 community cards have been dealt. The player makes his Ante bet and optional Bonus bet. Following a shuffle, the dealer deals two cards face up to the player and two cards face down to the dealer position. Three community cards are then dealt face up in the middle of the table. The player then has to make a decision. He can choose not to play his hand and Fold and all his bets will be lost. If he has a winning Bonus bet them to collect it he must Call. If he thinks he has the dealer beaten then he should Call. A Call bet is then taken which is twice the original Ante Bet. The dealer then deals the remaining two community cards and turns over his two cards. A showdown now takes place where the best 5 cards from each hand are displayed and compared. If the dealer has a pair of 4’s or better, he is said to have a qualifying hand i.e he has “qualified”.This means he’ll be able to pay players winning call bets in addition to the Ante Bet. 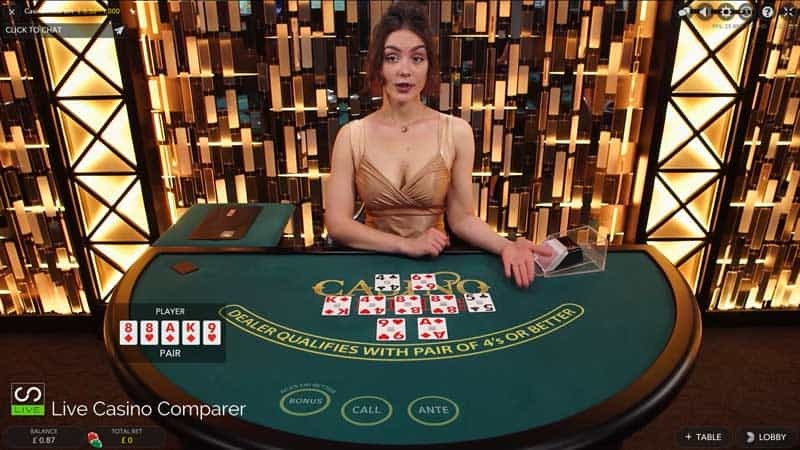 If the dealer qualifies and the player has a better hand the player wins. The dealers will pay the Ante Bet (at the displayed odds) and the call bet at even money 1:1. If the dealer doesn’t qualify, the player wins. The dealer will pay the Ante Bet (at the displayed odds) and the call bet is returned to the player. If the dealer beats the players then the player loses all his bets. If the dealer and the player have exactly the same 5 card hand this is known as a push. The players’ bets are returned to them. 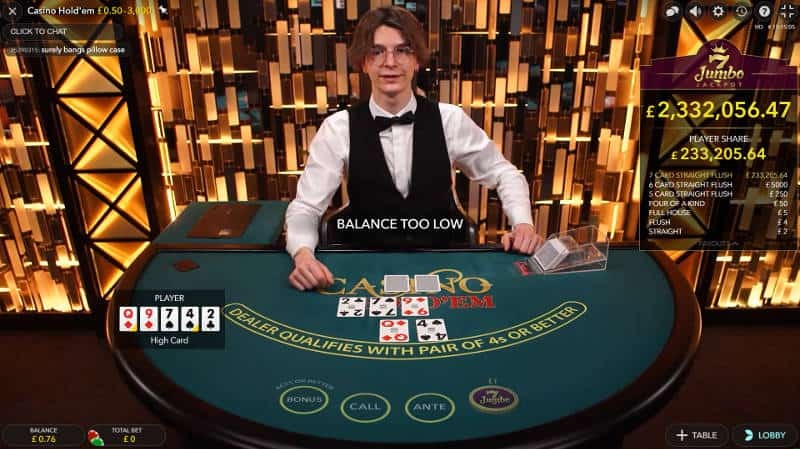 If the player has placed a Bonus Bet and the first 5 cards contain a pair of aces or more, he is paid at the displayed odds, as long as he placed a Call Bet to play the hand. The high card is the Ace, if this ties with another hand, then the second highest card in the hand is used as a tie-breaker, and so on until the hand is won or tied. Two identical valued cards, in this case a pair of 9’s. A pair of 10’s or above would beat this hand. If another hand has a pair of 9’s then the next highest card is used to determine the winner. Two sets of pairs where each pair is different from the other e.g. 9’s and 3’s. if another hand has two pairs then the hand containing the higher pair will win. One set of 3 cards that have the same value. In this case three 5’s. This hand would be beaten by three 6’s or above. A hand of 5 cards that form a run. The suits do not need to be the same, so in this example, we have a run of 3, 4, 5, 6, 7. Straights with a higher run value e.g. 5,6,7,8,9 would beat this hand. A set of 5 cards from the same suit. The high card in the hand is used to determine ties. This hand is a 10 high heart flush. This is a combination hand that is made up of 3 of a kind and a pair. The three of the kind is dominant in the hand and would be used to determine ties with other full houses. This hand would be referred to 9’s over 5. 4 cards that are of the same value, one from each suit. The value of the 4 of a kind is used to determine a winner if there is another 4 of a kind hand in play. This is a set of 5 cards in a run, but all in the same suit. In this example, we have 3c, 4c, 5c, 6c, 7c. The best possible hand in poker. A straight flush of the highest value cards in a suit. 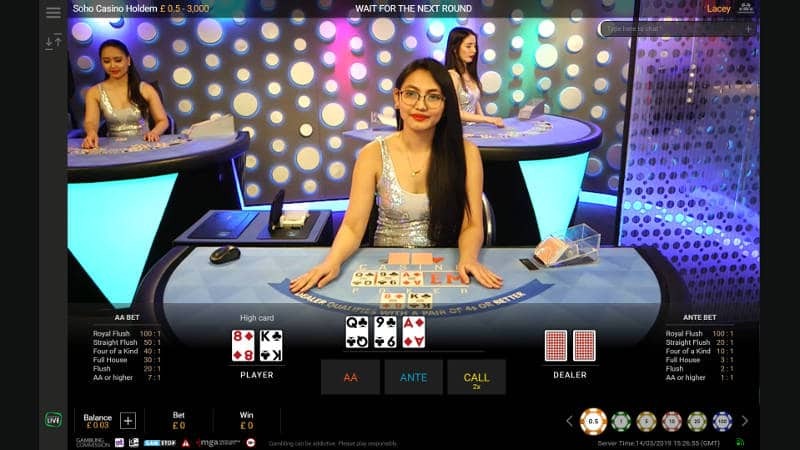 Evolution Gaming has introduced a Progressive Jackpot for their version of Live Casino Hold’em. It’s a network jackpot, which basically means that all of the casinos using their software and have signed up to offer the jackpot will be able to offer it to their players. The jackpot is paid when a 7 card straight flush is dealt. All players playing the bonus bet at the time the hand is dealt will receive a cut of the progressive jackpot. There are lesser prizes available for lower valued hands. These get paid to each player rather than a proportion of the payout. Play at most Evolution Casinos. ( A full list of participating casinos). Casino Hold’em is available at Playtech, Evolution & Ezugi Live Casinos. The games, payouts and playing rules are all the same. What’s different is how each game is presented, so lets take a closer look at each. The main difference with Evolutions Live Casino Holdem is the additional Progressive Jackpot. It costs £€1 to play as a side bet. The current Jackpot Value for April 25, 2019 is £2,470,444. Playtech has 2 Live Casino Holdem Tables. One is streamed from their Latvian Studio. The other is Soho Casino Holdem and this table is in their Romanian Studio. Ezugi’s table looks an plays the same as the other suppliers. If you’re based in the UK you can’t play at this table. Leo Vegas has both Evolution & Ezugi Versions. It certainly helps if you’ve played Texas Holdem poker, as you’ll already be familiar with what a good strong hand looks like. If you’re a poker player there is a basic strategy that will help you perform better at the table. Remember that you’re up against the dealer. You must have a better hand than the dealer to beat him. The cards you are dealt, your Hole Cards, determine whether tyou call or fold your hand when the flop has been dealt. A strong hand is one that will beat the dealer, but also one that has a high probability of making a winning hand. So good Hole cards to Call with are often. You have an Ace or King. You have a Queen or Jack unless the community cards are all the same suit and you don’t already have one in your hand. If you don’t, fold the hand. You have a Flush or Straight Draw and you only need one card to complete the hand. i.e. 4 out of the 5 cards are a flush or straight. Your two Hole Cards are Over Cards i.e. your two cards are greater in value than the 3 community cards, eg. you have Jack, Eight and the community cards are Seven, Five, Three. Fold if you have no cards that match the board and no cards over 10 unless you have a straight draw or flush draw. I know it looks complicated, but it’s not. Just follow these basic steps and you’ll be fine. 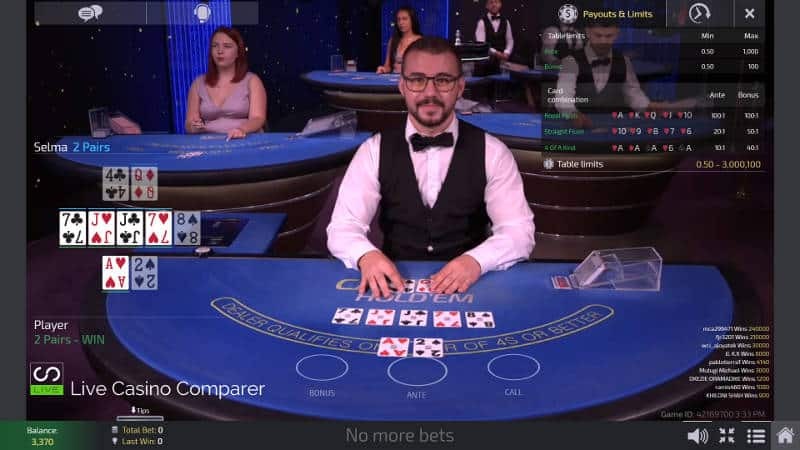 I’ve produced a list of the Best Live Casino Holdem casinos which gives you a choice of great live casinos that carry the game. Currently Playtech, and Evolution Gaming offer Live Casino Hold’em, although this is bound to improve as the market matures. Live Three Card Poker and Ultimate Texas Hold’em are other variants of the game. You can read more about live three card poker or other live casino games here.